I am really enjoying Borderland the Pre-Sequel and running around as claptrap finally able to shoot things and alien lifeforms for fun and folly rather than money! It’s funny because I try to act all serious as a Comical robot with an ego issue that sometimes backfires on him. I haven’t played any of the other characters as of yet, because I want to play thru to the end with each character but I chose Claptrap because he’s a cocky little robot with a ton a heart and Gumption! Are there many out there reading this that has the PC edition and would like to team up? What are your opinions on the characters and skill tree? Are you enjoy enjoying the back stories involved with the former set of vault hunters that you see in Borderlands 2 that are portrayed as villains? I love the environments as well plus the less than normal gravity adds to the humor and gameplay that seems to give you a slightly more challenging feeling than the previous games. The musical scores and songs are great as well, love the environmental mood settings. The baddie AIs are a pretty intelligent giving you some really cool shoot outs or hand to hand (Yes I like to smash across the jaw with my clap every once and awhile myself.) Post up comment; reach out to the ones that play! 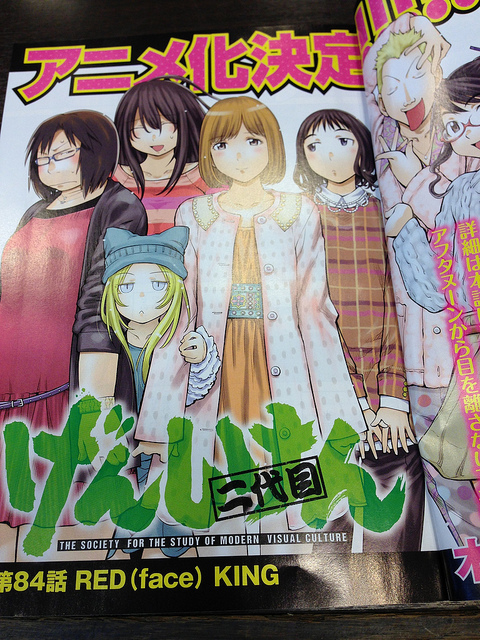 Genshiken Nidame get Anime Series ! So after the Madarame/Saki arc Genshiken would seem to relax a bit before going onward but Chap. 84 has some on edge. In our last chap. Madarame announced was quitting his job at the Sakura Piping Company close the campus stating he’d be unable to visit the club often as he used to, disregarding Kasukabi’s advice from quitting his current employment. Madarame seems alienated with the current club’s atmosphere, Yoshitake doesn’t help matters much by attempting to convert him to the BL circle of the Club, and Hato is having trouble coming to grips with his emotions being at odds with himself. Ogiue asks him to help out with a “Tiger & Bonny” doujinshi, Hato begins to think about his friendship with Madarame, and the thoughts of doubt Kaminaga placed in Hato’s head on whether he’s straight, gay or bisexual. Now, Sue of all people has shown feelings for Madarame in the process too, though her character might make it appear stranger than that. This doesn’t change the demographic in Genshiken as the base issue for Madarame’s decision. I think that Madarame’s relation to the Genshiken as an on-campus club is waning. I had the same type of experience when I attended SCAN at SDSU but after I moved out to Utah, things gradually changed. I’m still friends with people I knew from back then, however our friendship has survived in a certain sense, which even though we’re not around together to meet up and watch anime and RPG together afterwards doesn’t mean we’re not still friends. Seeing as how Genshiken has this focus on Hato, the realization he will more or less be the most psychologically complicated character in this part of the series. Ogiue as one thing, as her story cuts to the bone, but Hato’s situation you can’t say Oh gee he’s gay! That might be a possibility, or it could be something else entirely and we’re all reading more into it than we suspect. However, with what we have read in the recent past about he doubting his sexual orientation it’s easy to see that it’s not the only thing going on behind or in front of the curtains everyone. SO, here it’s everyone! A Month plus a few days and we get quite a bit for our patience. We not only get to see how Ohno deals with the employment prospects, while Sue is in tow, but we also get a glimpse of her facing the realities of the real world and her coming to terms as she wraps her head around it. Meanwhile we fade to the Genshiken Meeting room where we find our 5 Ladies (Hato in Girl mode) talking about the whole prospects and what Ohno could do self-employment wise, and of course COSPLAY! Is the first thing that comes to mind, is a COSROM. Ohno and Tanaka discuss the prospects of doing a cos-rom and Tanaka is from my view a bit torn on it, where as it would be a possible income, there are the ramifications of reputation on campus as well as the Japanese employment market. In truth, Ohno would like to get married while still having a degree in a field where she could support herself and Tanaka is push came to a shove at some point. During the photo shoot however, Tanaka has seemed to have given the whole situation some thought and while taking some pose shots proposes to Ohno. Needless to say she accepts but also it comes to light that she’s also quite inebriated thanks to the new members and a huge bottle of sake they gave her to build up the courage to do the shoot for the cos-rom. Rika and Hato go back to the meeting room to find Madarame sitting there browsing one the manga on the table and in casual clothes as well. The girls thought that was quite odd and asked why he wasn’t at work? 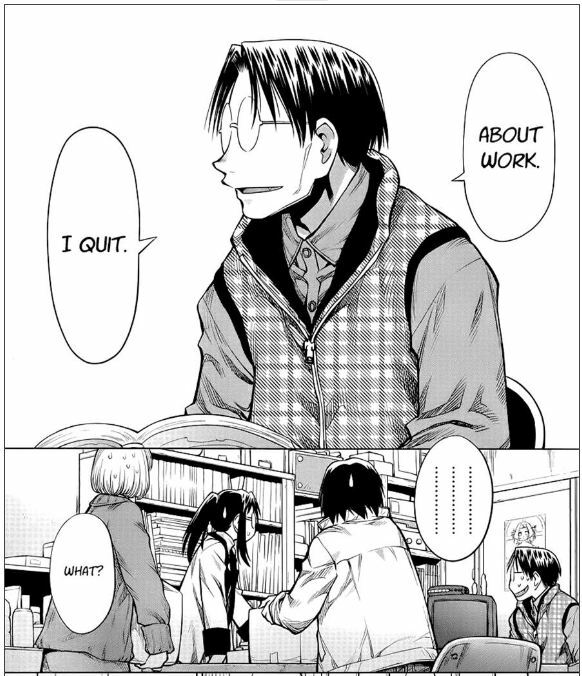 He simply stated “I quit” and with that we get a quick peek at what Kuchiki is doing which is well doing some OTJT at his father’s banking firm, while Oguie is working on her manga for the Winter Comifest and juggling her college studies. What’s been going on overthe past few weeks? So some big changes have come along the lines. The Cybernaut Podcast has been turned over to me in full. The reasons given were that Dustin and Dave wanted to concentrate on their college courses more for now and may start a new podcast in 2013 at some point. Josh is still onboard for the time being and stepping into to fill Dustin’s shoes is one of my old friends from San Diego California, Robert Jone aka Tobias Steele and One of my friends from one the older and still operational mucks on the net Anime Muck, one Ken Akamatsu AKA Max Sterling/Jenius. Our European field operative hails from Her Majesty’s own Carmarthen/Carmarthenshire UK David Treharne an up and coming Game Developer and Current Games Review for an online Magazine publication site. We’ve had our first podcast here two weeks ago with Arik R. Avila of D7 Studios and his Production Assistant and current love interest 😉 Ms. Ciara Flynn as well as Actress, which went over well save for an audio issue where we picked up a reverb echo over the broadcast and we never could track down who it originated from. Anyways, we’re almost done with the reedits and will be posting it at the podcast WP here by the end of the week. Next podcast is going to be pretty cool as well, we have from Funimation’s own Voice Acting troupe Mr. Christopher Patton, along with Mr. Richard Davis who has been teaching over in japan on again off again for over a period of six years collectively and will share some insights to you listeners out there on what to expect if you’re one of those few that wish to make a career overseas in Japan. We also have Steve “Warky” Nunez, infamous Convention Keyboardist extreme and a dubiously funny voice actor himself and have been noted for lending his voice for the Anime Parody of Card Captor Sakura Abridged. And it’s been snowing here off and on but seems to be melting off pretty fast too. The end of the world supposedly will be in ten days from this posting so let’s all hope the Mayans had it wrong eh? Christmas tree has been placed up the house has its lights up and all seems ok with the world for now, but I still have the feeling for the other shoe to drop and ruin everything for the holidays. Who has something to share for their Christmas list this year? OH COME ON PEOPLE! Someone out there must want to share at least one thing they want for Christmas? Really? No one? Ok I’ll start then. 4. I have Volumes 9-8 and 7 of Genshiken the Manga and I’d like to at least be able to have 1 thru 6 or 10 thru 13 of the NEW Genshiken 2nd Generation so at least I’ll have either collected the old series up or I have picked and have collected upto date the new series. 5. One decent environmental game artist that will stick with the team and not wander off somewhere because all of a sudden “Gee, this seems like actual work” feeling comes across their brain. My youngest made it to the school district’s Honors Orchestral Symphony and tonight is her last night for the Christmas circuit. My eldest has an appointment for a college essays one night course tonight has well but we have it all juggled to where it should work out just fine. Oh before I end this entry, let me promote firefall first. Firefall has been in closed beta for a few months now and I’ve just started myself like 2 sessions ago and have to say this is a MAD CRAZY MMO SHOOTER ! Damn I haven’t had this much fun since Quake came out. The Environment is lush and the palettes and textures were well thought out. The Questing w/o giving away too much is pretty cool as well. The game and questing definitely promotes great team play and a balancing of solo missions with some nice swag to go with you as well. This is one FPS MMO I’ll promote as well. That’s it for now, comments as usually are welcome but keep em clean and be a tad respectful, we do try to keep the maturity level to a PG-13 level around here.